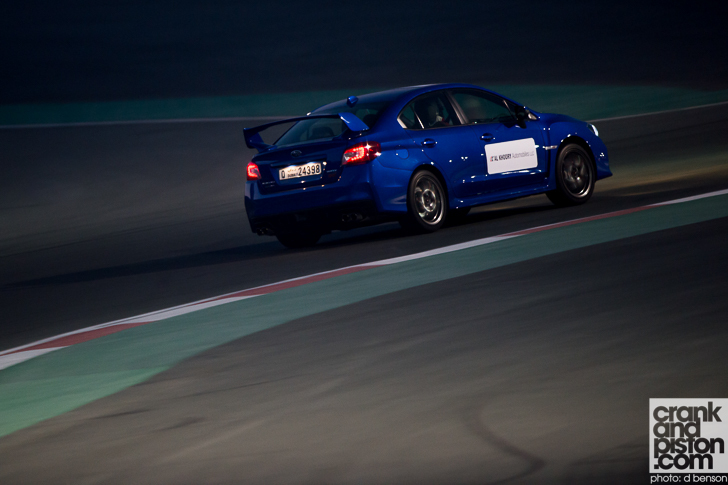 We grab our first taste of Subaru machinery in a while on-track at the Dubai Autodrome. Oh, and it’s with a Subaru WRX STI. Yay! The Subaru Impreza belongs on the rally stages, right? Even though the Japanese icon hasn’t officially entered a World Rally Championship event in almost a decade, its title success with Colin McRae, Richard Burns and Petter Solberg – as well as a trio of Manufacturer’s crowns – to this day remain among the series’ most popular: chances are if you were an Impreza owner back in the late 90’s/early 2000s, it too adorned the Prodrive-blue paint, gold alloys and bonnet scoop. Indeed, up until last year the Impreza competed officially on the Global Rallycross stage with Subaru USA, is still entered by independents for the Intercontinental Rally Challenge, and has lost the Rally America national championship only once in the past 11 years. Where else does a Subaru Impreza belong other than a rally stage? Well, as it turns out, the track. Times have changed considerably since Subaru’s heyday. Since 2011, the ‘Impreza’ four door saloon has been marketed under the ‘WRX’ moniker (which ironically stands for ‘World Rally Experimental’) to give the Impreza hatchback fleet a forceful shot in the arm. Today Subaru’s motorsport program focuses more on endurance racing (the STI has taken three class victories at the 24 Hours of Nürburgring in its last four attempts) and its new British Touring Car Championship campaign, with rumours of a mooted WTCC program also doing the rounds. Let’s also not forget that those halcyon WRC days are almost 20 years old now. It makes sense then that crankandpiston.com’s first taste of Subaru machinery on Middle East turf is on-track at the Dubai Autodrome. Our test model today is a 2015 Subaru WRX STI, an update of which we’re hoping to grab a more extensive road test with when it arrives this summer. So, what’s changed since the previous generation? 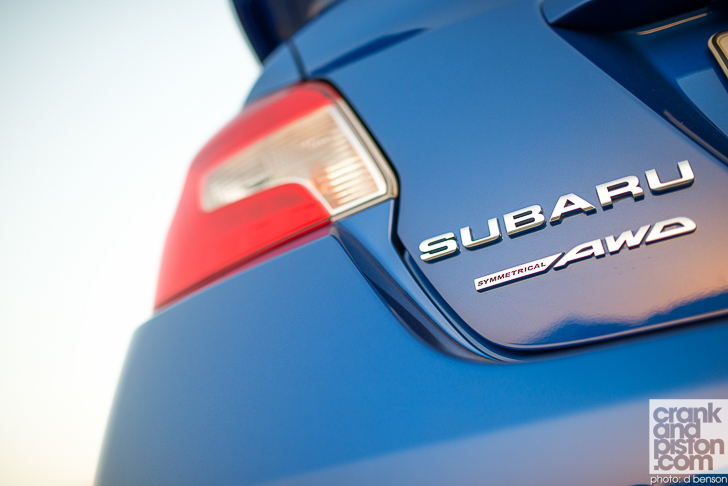 Although Subaru refrains from mentioning a ‘clean sheet’ redesign, little of the previous generation WRX has been carried over. The base for instance is now 140 percent stiffer – hold tight, we’ve got more numbers coming up – which apparently equates to 16 percent less bodyroll, courtesy also of stiffer spring rates both front and rear, 22 and six percent respectively. Even the rack for the hydraulic steering – electronic having been given the boot – is now 15 per cent quicker, all of which combine to curtail the wayward handling of the outgoing model. It’s the engine though I’d like to start with, which aside from some ECU tweaks, is largely the same 2.5-litre boxer four-cylinder used by the predecessor. Not that it’s lacking grunt though, the STI-exclusive unit kicking 296bhp and 290lb ft from those 2457cc, plus a fairly sizeable turbocharger that packs 14.7PSI of boost. Pretty well. Though a 5.2 second 0-100kph time pails in comparison to the Subaru WRX STI’s principal rivals – both the Mercedes-AMG A 45 and Audi RS3 Sportback shave a full second off that – the WRX STI nevertheless feels genuinely quick in a straight-line. Wait a beat for the turbocharger to spool up, and by the 3000rpm it’s ready to go. By the 4000rpm mark, it’s positively champing at the bit, pulling with vigour towards an 7500rpm redline (just watch that boost gauge needle leap). 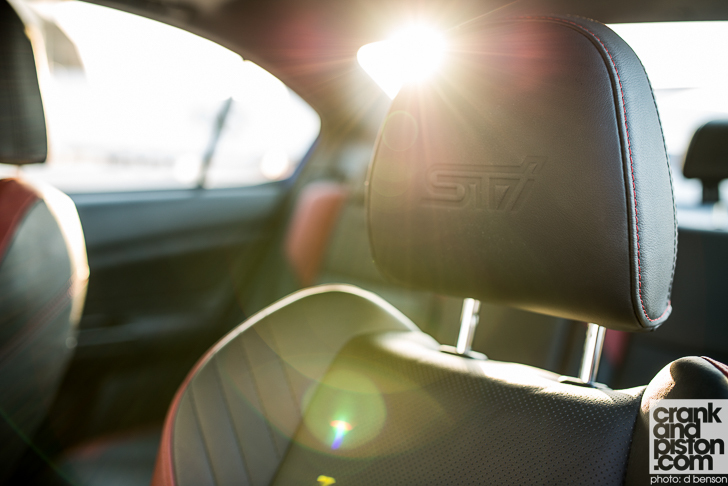 It’s admittedly tight sweet spot, but keep the revs high and time your shifts properly, and this unbridled mid-range grunt keeps the STI emphatically on its toes. It’s with a slightly tentative approach then that I approach the long-handed turn one, still well into the triple figures of the analogue speedo, firing down the gears as quick as I dare with a six-speed manual gearbox (hooray!) that feels slightly more ponderous and notchy than I was hoping for. Front-end grip though is phenomenal, refusing to wilt even after two hours of almost constant on-track punishment and ensuring a very pointed front end that can be hauled. There’s ample feel through the more steering column too, if perhaps inconsistent weighting: power-assisted nunnery can kick in through the longer sweepers, a shame given the sharper and more direct bite at lower speeds. Saying that, Subaru owners and fans I speak with in the paddock during the evening assure me the WRX’s precision is a big improvement over the old model. After a succession of fast laps, the brakes are starting to lose their initial bite. And yes, there’s impressive amounts of lateral grip and turn-in is so keen it almost throws down a gauntlet, thanks primarily to remarkable composure and little significant bodyroll. Still though there lacks a certain finesse: there’s so much grip that the rear tyres only start to step out when you’re really harrying the front end, meaning it’s not the most adjustable of cars mid-corner. That stiffened chassis makes me curious about on-road ride comfort too, though we’ll have to wait for a more extensive test further down the line to find out. My main concern though is the interior. Compared with the superb look o the outside – all big rear spoilers, shouty air intakes and bonnet scoops, and ‘Raptor stare’ headlights – the cabin by comparison feels a bit dated. Don’t get me wrong, I’m a big fan of the ‘whiplash reducing’ sport seats and flat-bottomed steering wheel, but the button-heavy multi-function steering wheel, overly shiny switchgear and old-fashioned liquid crystal display for the stereo, plus a few hard plastic surfaces, just feel unnecessarily retro against Subaru’s more premium segment rivals. Diehard fans may – and probably will – disagree, but to this particular writer, a refresh is needed sooner rather than later. So, Subaru WRX STI. Overall verdict? It’s been a while since we’ve experienced Subaru performance in the Middle East or indeed have seen this level of promotion in the region, despite the marque’s legion of local fans and owners. Conversation with regional dealers Al Khoory Automobiles suggest this is all about to change though and that track-time with the WRX is just the beginning. Consider our appetites suitably whetted.